Dr PurusQttama Bilimoria's book on sabdapramaIJa is an important one, and so is likely to arouse much controversy. I am pleased to be able to write a Foreword to this book, at a stage in my philosophical thinking when my own interests have been turning towards the thesis of sabdapramaIJa as the basis of Hindu religious and philosophical tradition. 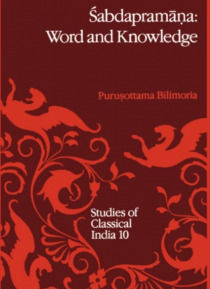 Dr Bilimoria offers many novel interpretations of … classical Hindu theories about language, meaning, understanding and knowing. These interpretations draw upon the conceptual resources of contemporary analytic and phenomenological philosophies, without sacrificing the authentIcity that can arise only out of philologically grounded scholarship. He raises many issues, and claims to have resolved some of them. Certainly, he advances the overall discussion, and this is the best one could hope for in writing on a topic to which the best minds of antiquity and modern times have applied themselves. In this Foreword, I wish to focus on one of the issues which I have raised on earlier occasions, and on which Dr Bilimoria has several important things to say. The issue is: is sabdabodha eo ipso a linguistic knowing, i. e. , sabdapramll, or does Sabdabodha amount to knowing only when certain specifiable conditions are satisfied. It the second alternative be accepted, these additional conditions could not be the same as the familiar Ilsatti (contiguity), yogyata (semantic fitness), dka;,k~ll (expectancy) and tlltparya (intention), for these are, on the theory, conditions of sabdabodha itself.